The 2017 Brule Art Scholarship winners were Jessica Gill of Escanaba (left) and Chloe Haataja of Houghton. In addition to other funding and scholarships – including the U.P. Commitment Grant – each student was awarded $20,000 courtesy of David and Elsa Brule. 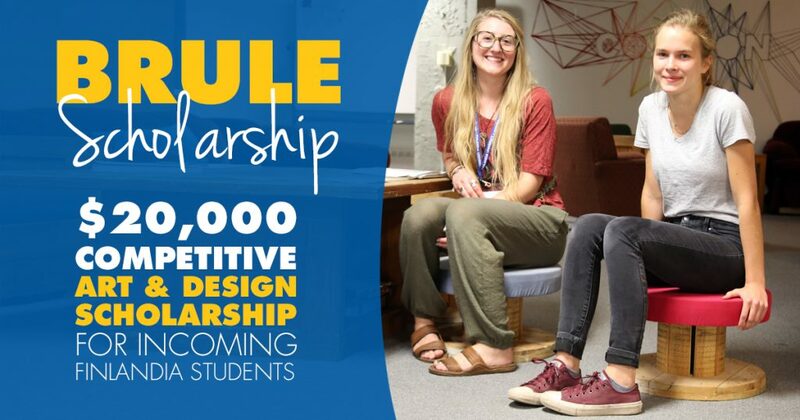 Finlandia University is now accepting applications for the Dave and Elsa Brule Scholarship. This competitive scholarship is for students interested in studying art and design in the university’s International School of Art & Design (ISAD). The scholarship recipients will be selected based on a portfolio competition. Applicants will need to be present for the Portfolio Review Day on Finlandia’s campus on Saturday, May 5, 2018. That event is from 10 a.m. to 4 p.m. Student-artists working in all media are invited to submit a portfolio of their original work for the competition. The work will be evaluated on composition, concept, range, craftsmanship and originality. To participate in the art scholarship competition, prospective students must apply and be accepted to Finlandia University by May 1, 2018. Students must have a grade point average of 2.5 or better, have an ACT score of 16 or better or SAT score of 880 or better, have applied to and been accepted to Finlandia University, and have completed the 2018-19 FAFSA. This is only open to new incoming students slated to start in the summer or fall of 2018. While the work is being juried by Finlandia faculty on May 5, students will tour the Finlandia campus and have lunch. The Finlandia University International School of Art & Design is located in the Jutila Center at 200 Michigan Street in Hancock, Michigan. For details about the scholarship competitions, please contact ISAD dean Denise Vandeville at 906-487-7379 or visit finlandia.edu/art.